Very cool! I will be interested to hear your thoughts on the DCT. Its gotten mixed reviews. I would really like to try it. I was very skeptical at first as I fave tried other "automatics" in the past and wasn't impressed. Now that technology has improved and I'm more used to the idea, I'm intrigued. It was a hard choice to make I don't need it but most of the things I have read or watched it seems like it's the way to go especially when you are tired after a long day you just give it throttle and not worry about shifting and watch your line. I can't wait to ride it hopefully we get some warm weather to melt the snow soon. I got to ride DCT & manual last summer while at the Horizons Unlimited Meeting in BC. I was way impressed. Like GB, I'm old school & didn't even give the DCT a thought until the next day when talking to the Honda rep & a couple others that had ridden it. So, I signed up & was impressed. The suspension is spot on too! Only thing that compares is the electronic suspension on the GS's. Honda hit it out of the park with this one. I am really considering an AT...even rode the new Goldwing just to try the DCT last week....as I'd never given it much thought. What's your opinion on a DCT for riding in Big Bike gravel and road conditions. How is the 2 up scenarios? Yeah...would be for me and my gal for the times she is willing to join me on the adventures....not on the CBR. 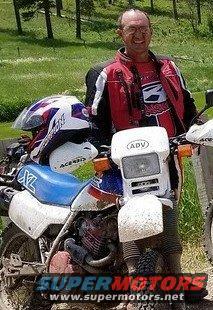 Its on the Omaha Adventure Rider face book page. I can get contact info if you need it, can't move pictures but it looks like new. We are selling April’s decked out Africa Twin. It’s a 2016 with only 2059 miles on it. It has over $2200 in accessories. Sw motech hand guards $152.60, bar risers $79.95, touratech adv pegs $189.95, brake reservoir cover $47.95, touratech headlight cover $139.95, sw motech chain guard $129.95, touratech kick stand pad $69.95, sw motech skid plate $282, Honda crash bars $349.95, Honda center stand $199.95, gps mount $59.95, tusk pannier racks that are new in the box, has brand new knobby tires, comes with the stock tires that are like new. $10,000 gets it all. I'm being encouraged to look seriously at one. A GoldWing can wait....(her words). And it wasn't even discussed about it replacing anything....who Am I to argue with that? I joined up and found the bike you mentioned. It looks like new. If I can be of any help let me know.